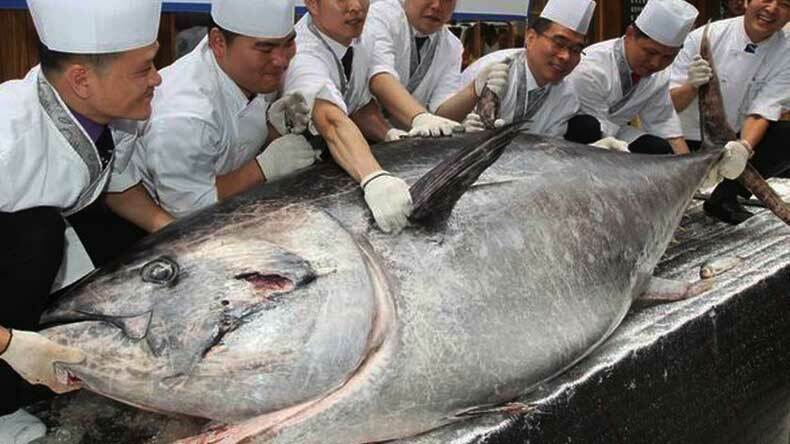 A Japanese sushi chain owner brought a huge premier quality bluefin Tuna fish by paying over Rs 2 crores. Hiroshi Onodera the owner of Ginza Onodera chain of restaurants wanted to claim the fish by becoming a record breaker in the market. In India, one can easily set up a high profile restaurant for £238,000 (INR 2,0436,313.60) but a Japanese restaurant owner has paid that amount to buy a prime bluefin tuna fish at a Tokyo fish market. The tycoon, owner of an international high-end sushi restaurant chain got his dream deal after tussling in the market for almost one year. He brought the 405-kilogram fish in an amount which can buy a common man a high-end house to live in India. Hiroshi Onodera, the owner and president of ‘Ginza Onodera’, a sushi chain which has stores around the world including the likes of big cities such as London and New York reportedly paid Rs 36.45 million yen (Japanese currency) which is equivalent to £238,000. By the amount paid for the 405-kilogram creature, a kilo of its meat costed Onodera £590 pound or around Rs 50,000. Despite forking out such a giant amount for fish, Onodera failed to beat the record price that has been paid for a premier species of a tuna fish. The tuna fish is in heavy demand among the top restaurants and food chains due to the growing popularity of sushi. Tuna fish is considered to be the best kind of fish in Japanese delicacy. The bluefin is a rare species which is considered as one of the best material for the dish. The fish brought by Onodera was caught from the Aomori coast in Japan. Onodera specifically wanted to buy the fish to ensure the quality of sushi at his chains.